Let me tell you something about music videos without music and how to make them so that you can create your own non-music-MVs tomorrow! 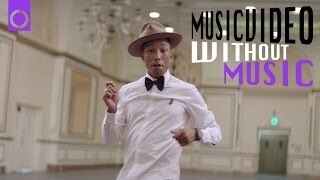 Pharrell Williams Are Ultra “Happy” Without Music! And, How Can I Make A MV Without Music? It’s so scary and curel that I cannot stand it. The most horrible part is the moaning push-up-man in the red room. Is that a torture or pleasure? Duh! Without Music Channel is operated by a couple in the Netherland. They are musicians and acquainted with sound effects. Their music videos without music based on famous hit songs are very popular. 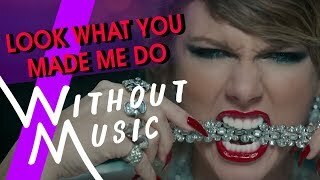 The music-less videos look vivid and stupid. The videos deliver the live atmosphere of the shooting location. What a hard work you have to do to create a fantasy...I’m impressed. On the other hand, the video that is sweet “without music” is like a pretty girl even without makeup, which may make you fall in love with. It’s so interesting to listen to the real(?) sound of biting diamond necklace, a legendary scene. I just thought that the song “Bad Guy” sounds quite like this Tayler’s song. The two songs are close as sisters. Does Billie try to be sarcastic? If I could handle music soft, I would create a mashup for fun! This is a perfect angelic perspective, though in full color. (See “Wings of Desire”) Oh, Pharrell, I really wanted to “encounter” you when you quietly shooting this film in a tiny alley of New York. I promise you I will not take a picture of you with my smartphone since that’s a too ugly deed. This video gets more beautiful after removing its makeup. His song does not need a synthesizer. That said, I love his collaboration work with Daft Punk. I always think Pharrell Williams must be a Perfect Human. If he found a bullied boy in the class, he will try to make it stop. If he picked up a 100 dollars note, he will not hand it to a policeman but give it to a homeless. This is my article on his masterpiece “Happy.” I wrote it with real enthusiasm. This is a different channel from the channel which created the above three videos. He is disclosing his technique to create a non-music mv. He uses free-soft Filmora. Wow! In Filmora, you erase the original sound of the MV and impose sound effects and your voice. Sounds simple. As for TheKosmic Channel, it goes like this. ...Oh my! He totally ruined the song. I feel sad because I like this song. I really think humor requires a kind of sense.